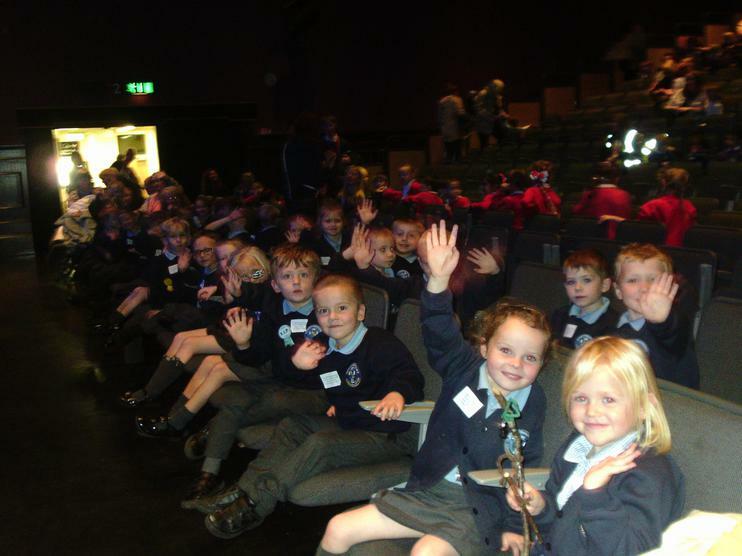 On Tuesday 4th October Year one were so very excited. 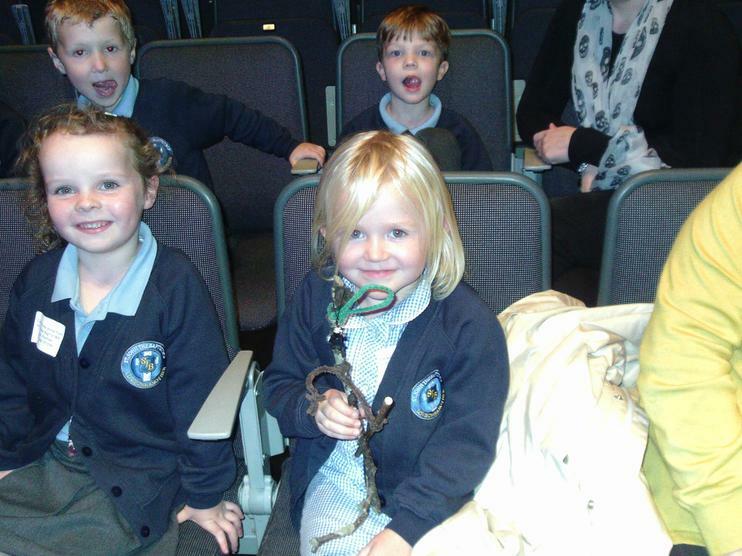 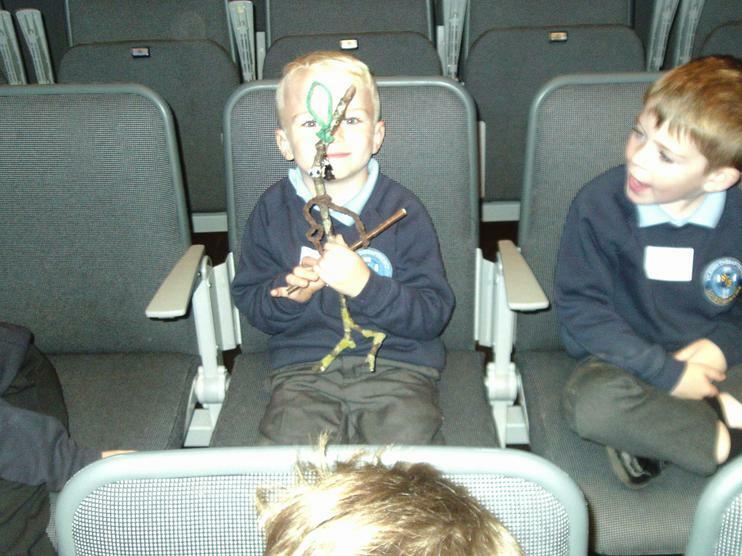 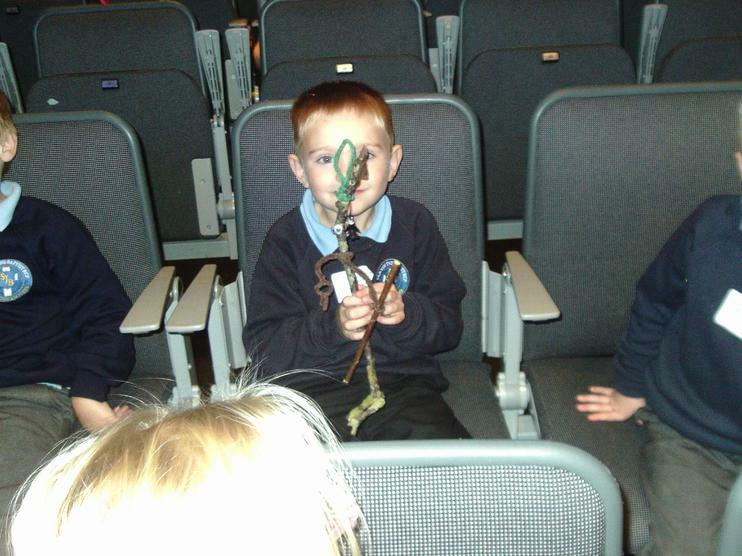 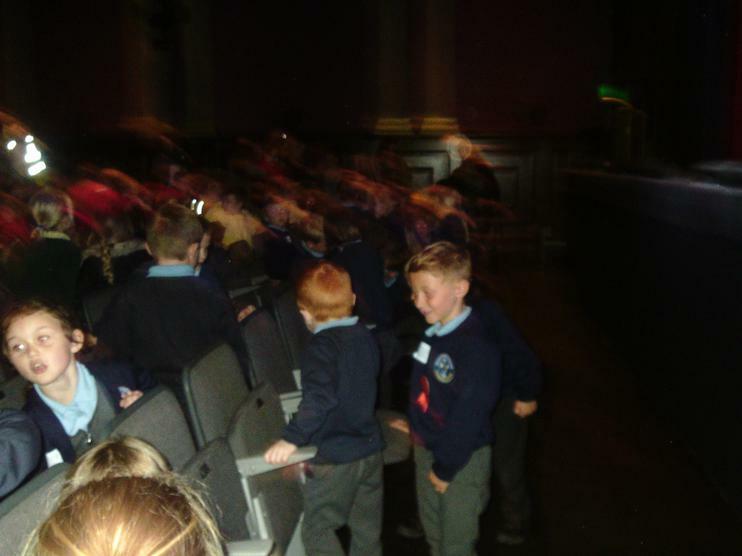 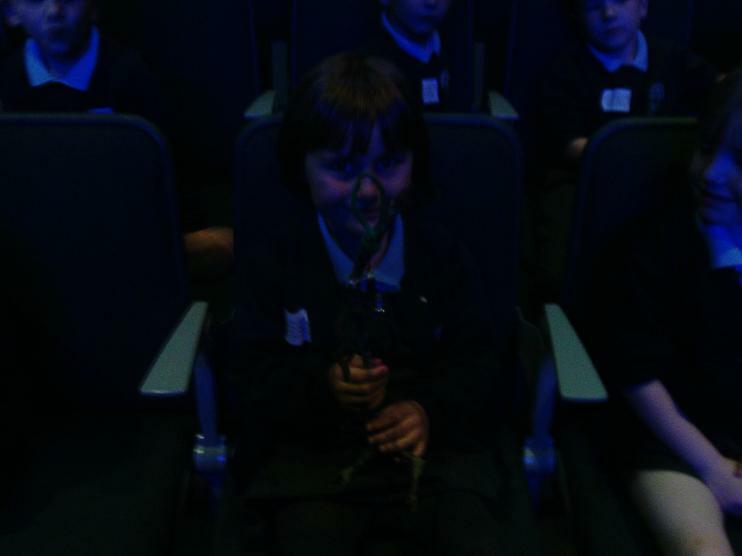 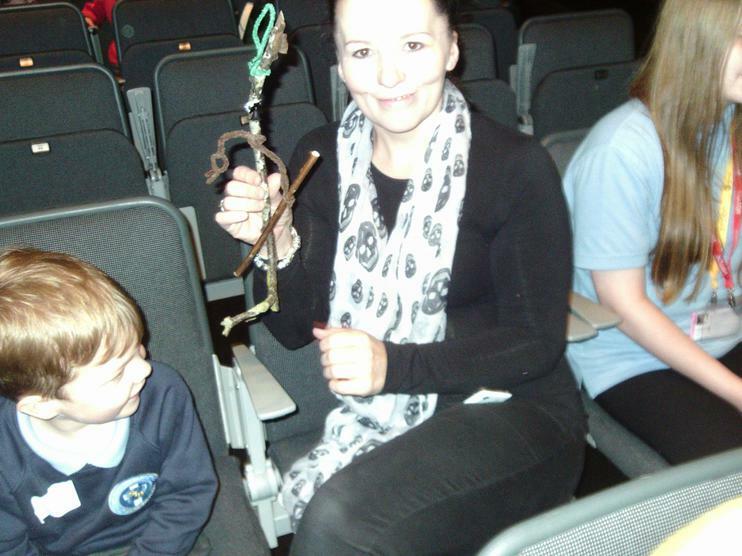 We had been waiting since the first day of the school year to visit the Mechanics Theatre, Burnley. 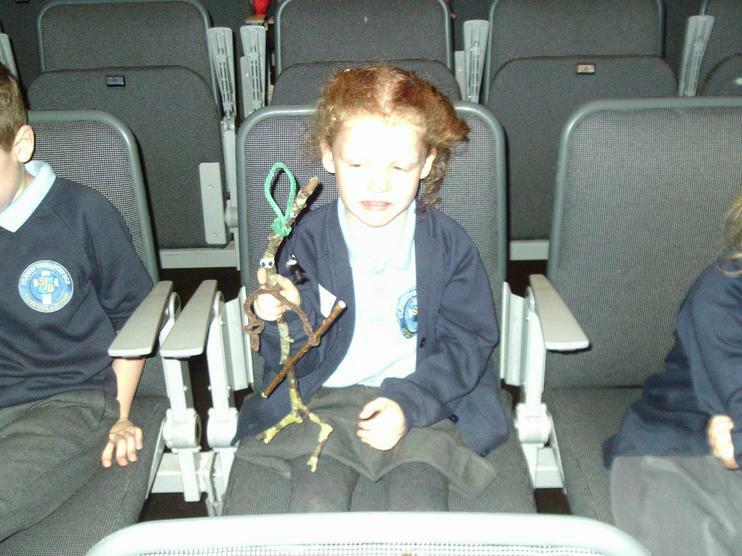 We were going to see Stickman. 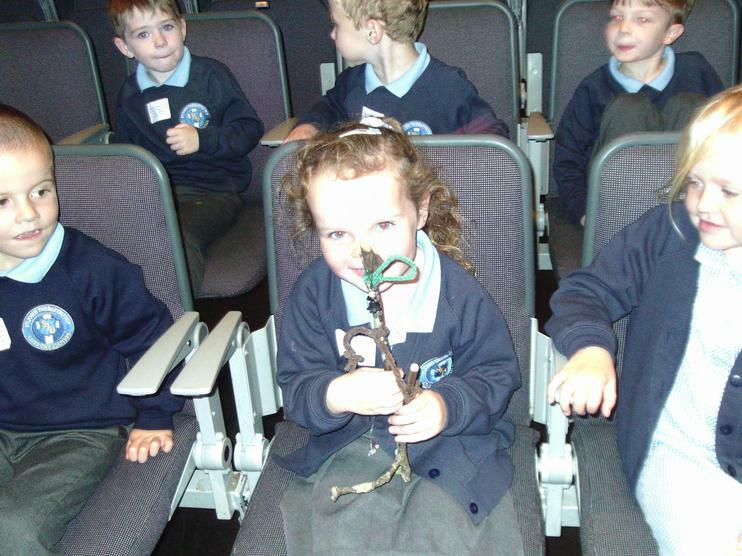 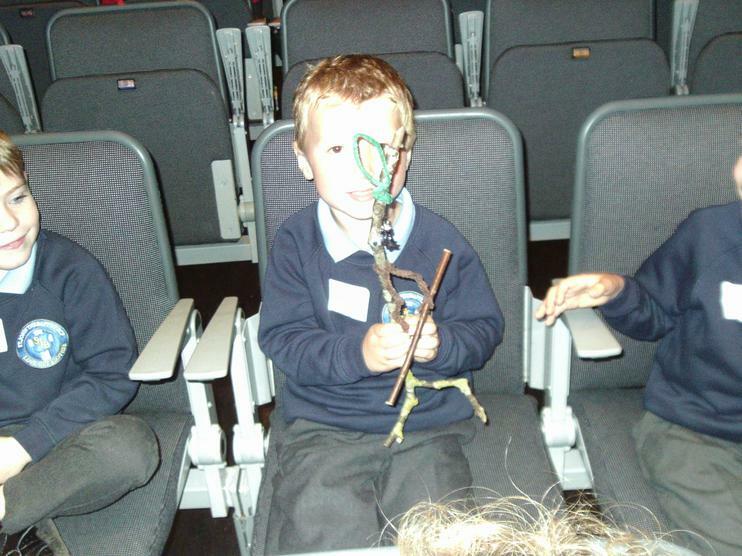 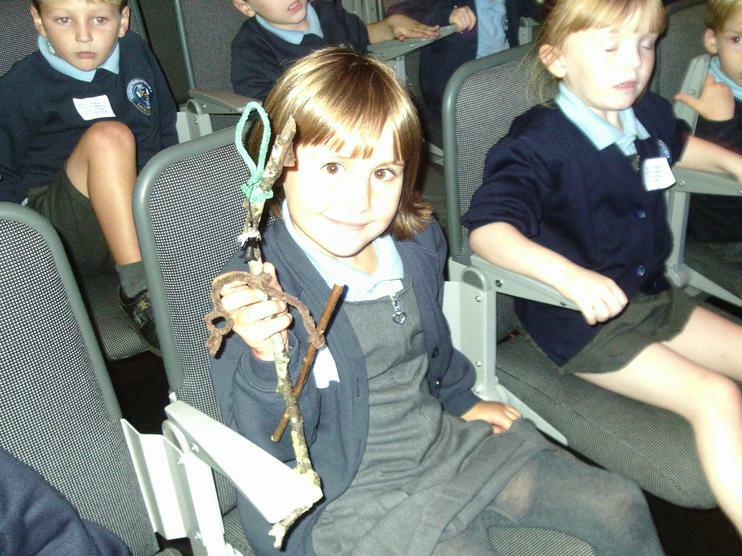 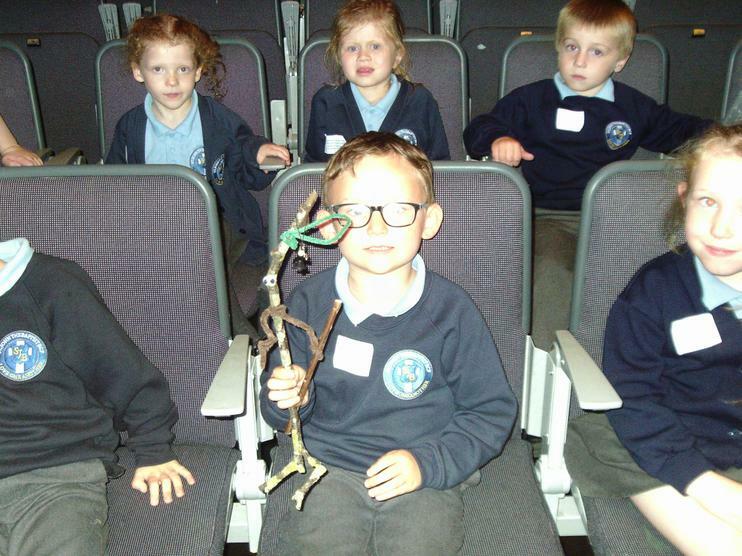 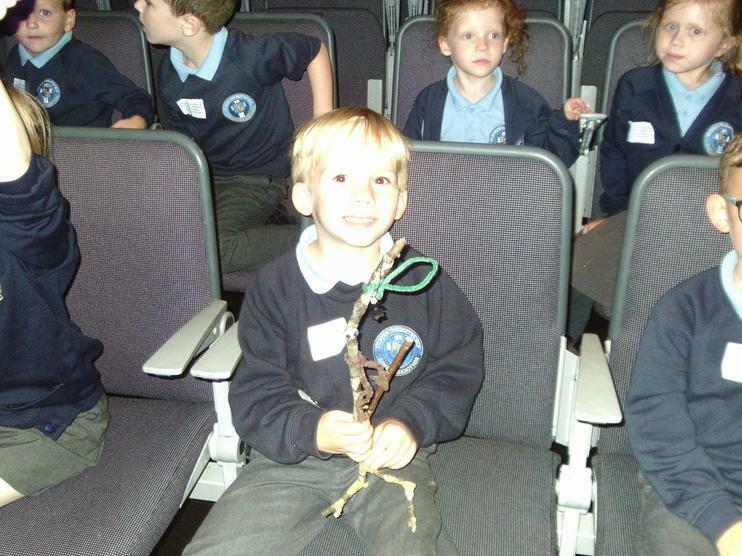 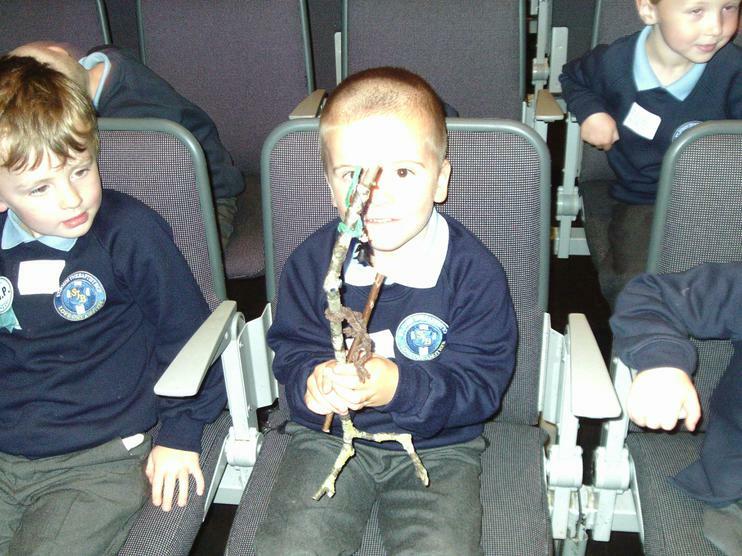 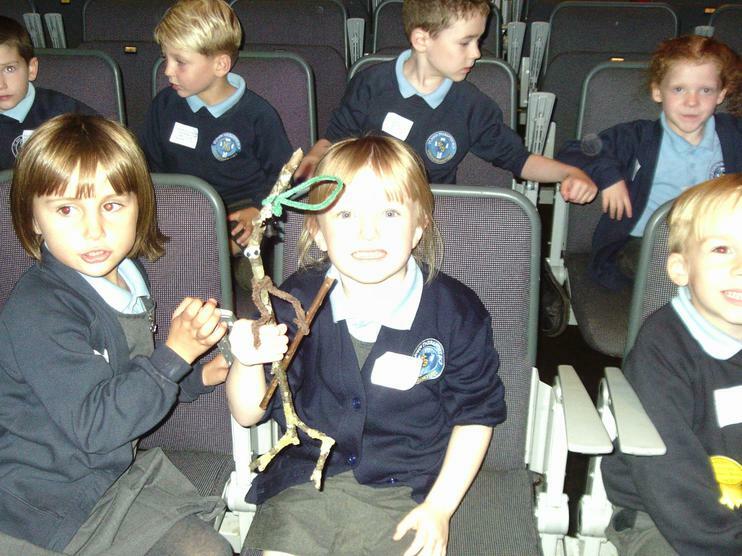 All the children decided that Stickman could go along as he hadn't tried to escape for a while. 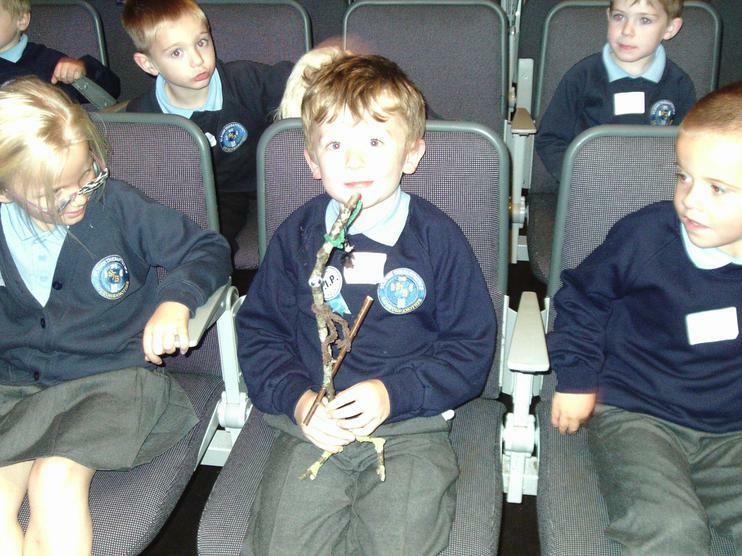 We all had an early lunch and returned to class to get ready and meet our grown up group leaders. 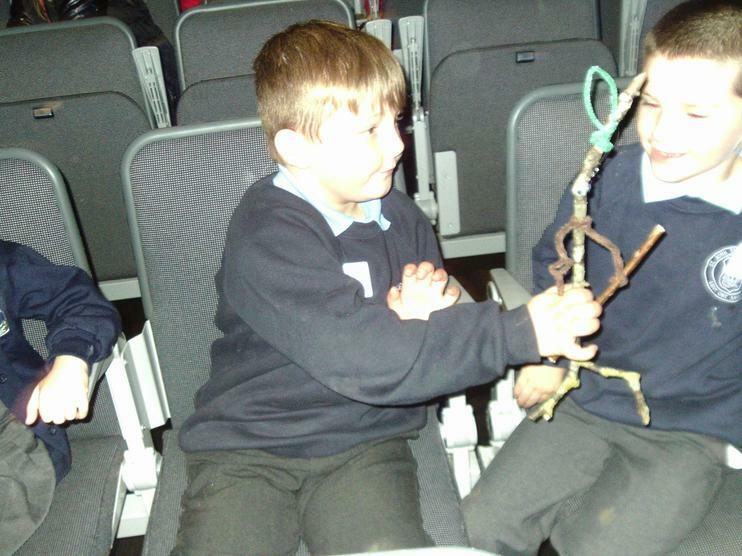 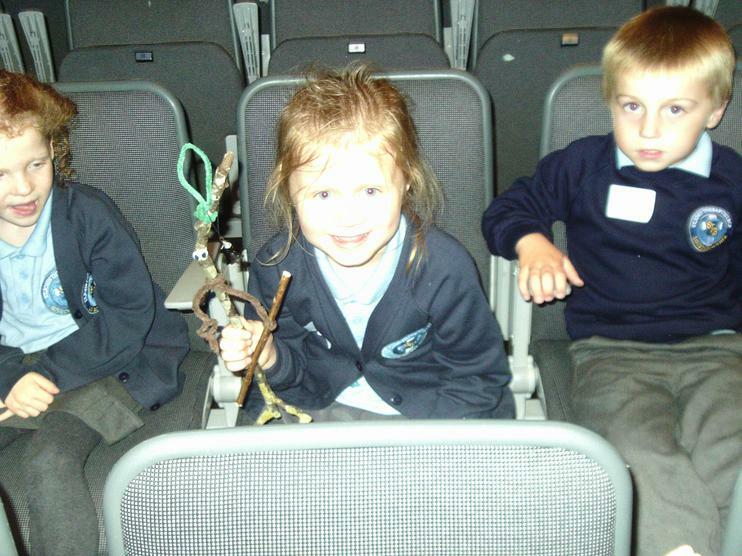 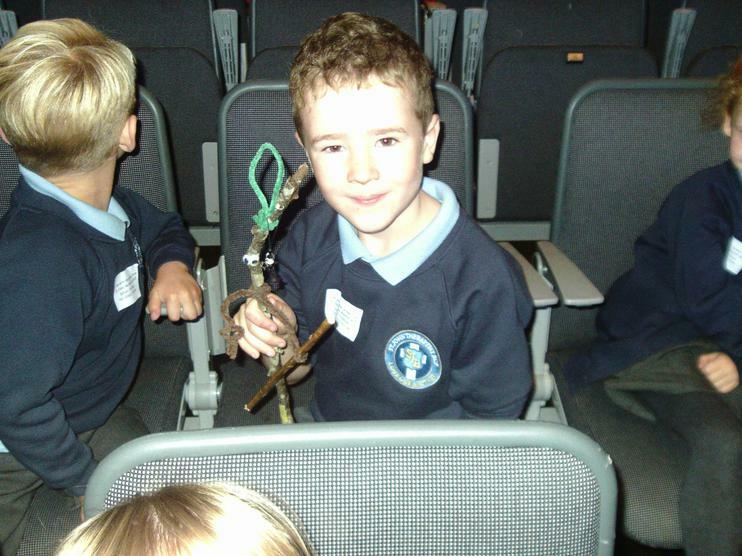 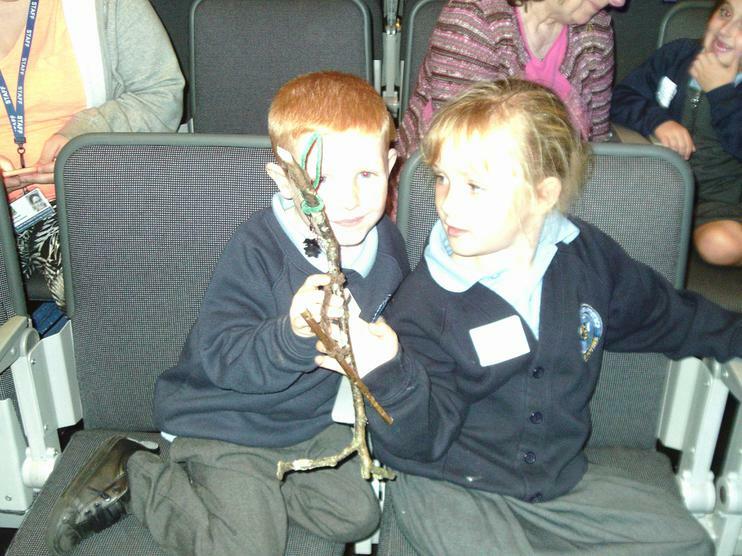 We were just about ready to sett off when we realised that Stickman had vanished from the Family Tree! 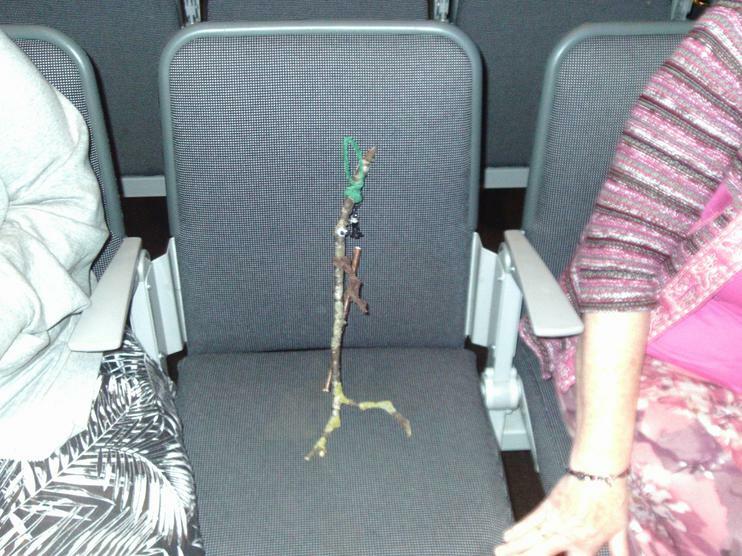 We had no time to search for him and were very sad that he would miss the show. 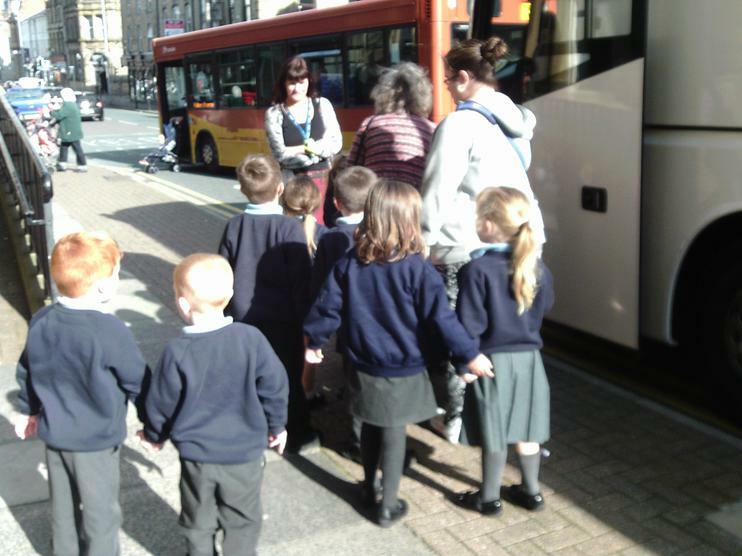 The first groups of children set off for the coach. 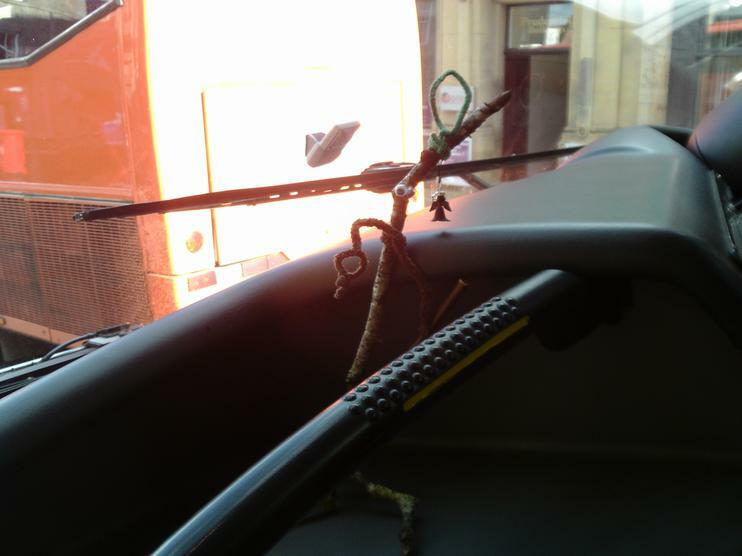 Guess who was already on... yes Stickman! 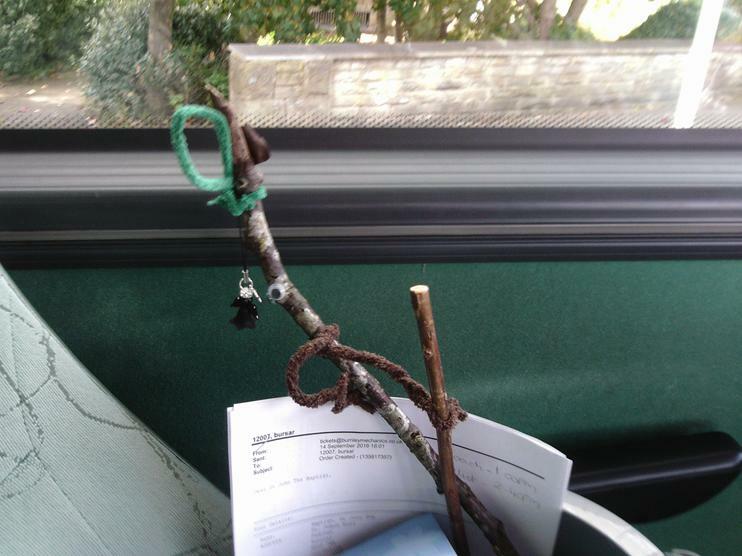 We don't know how, but he had gone to the coach before us! 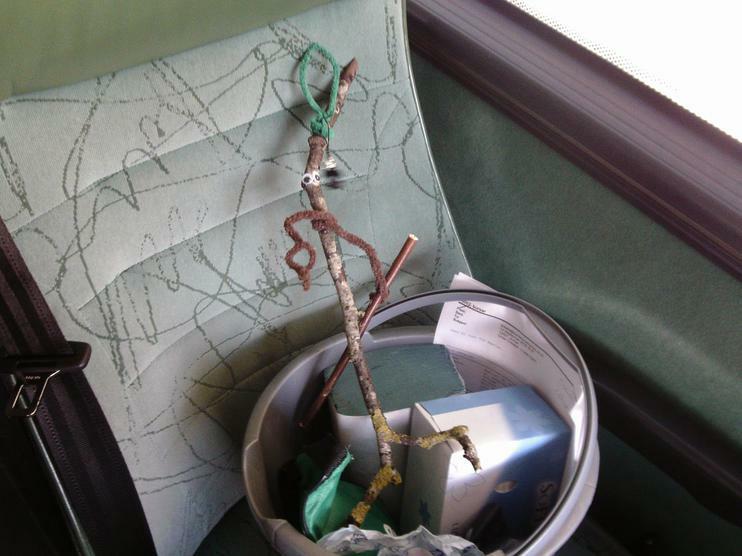 He decided that the best place for him was in the bucket of First Aid equipment. 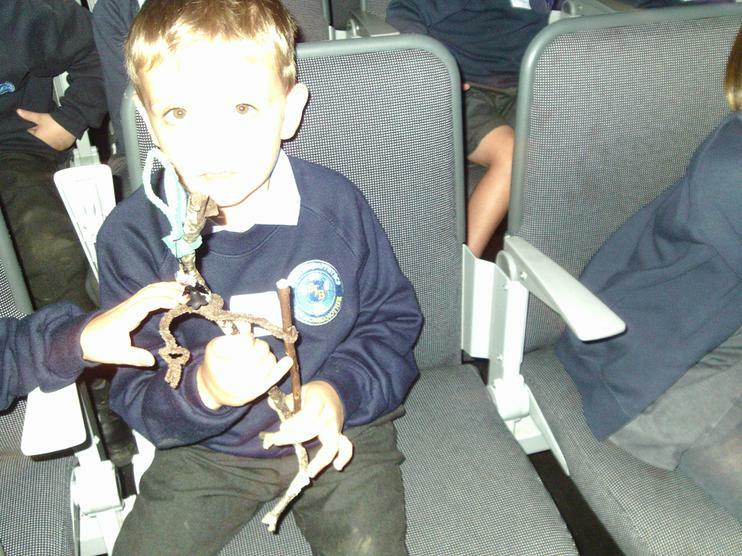 We think he felt safe there because the seatbelts were too large. 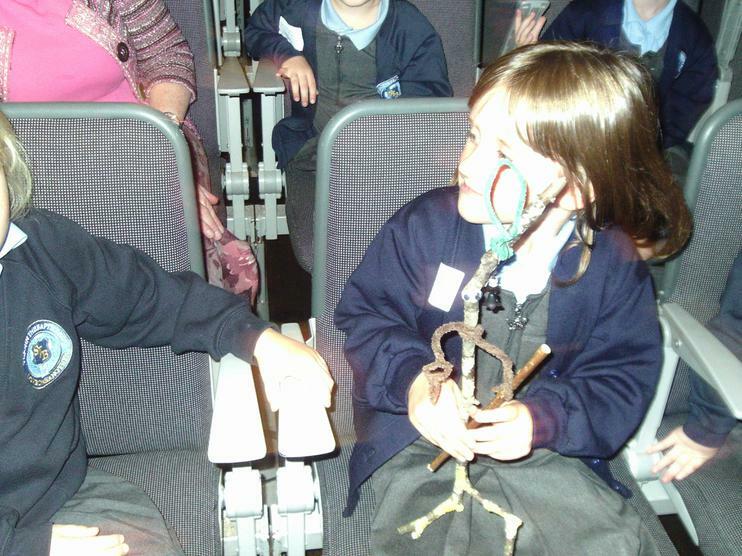 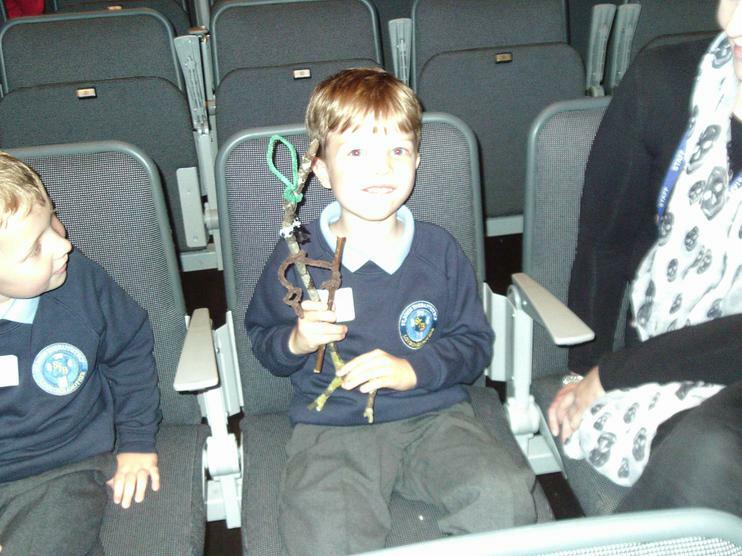 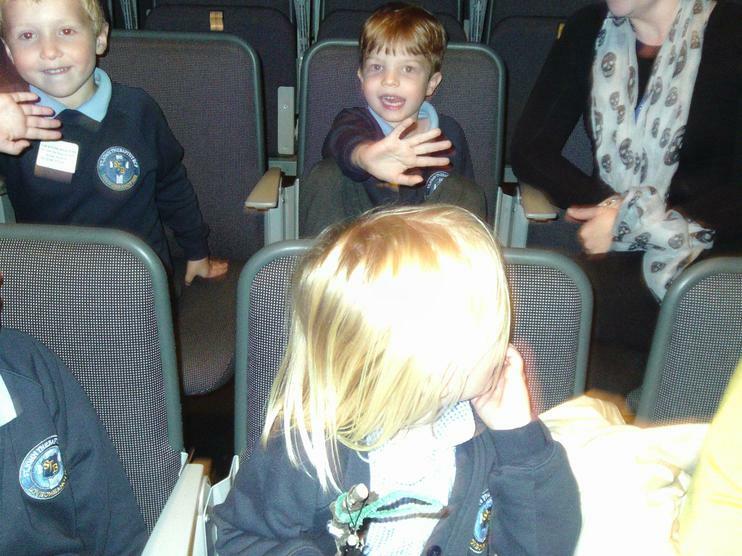 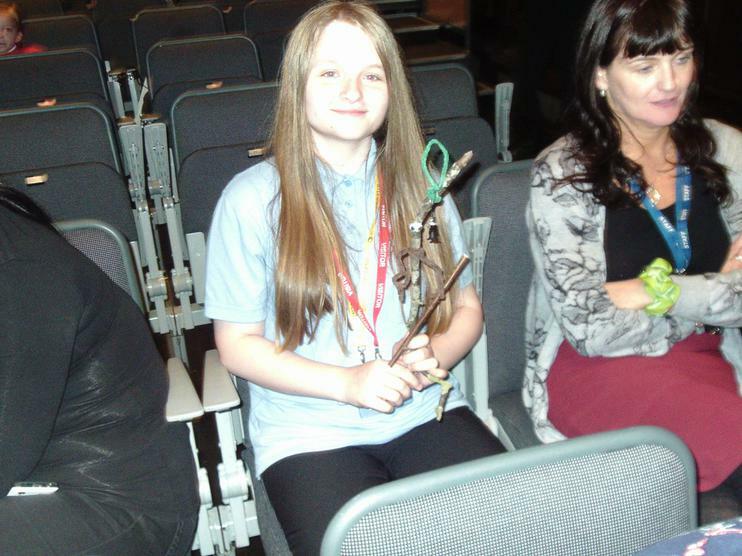 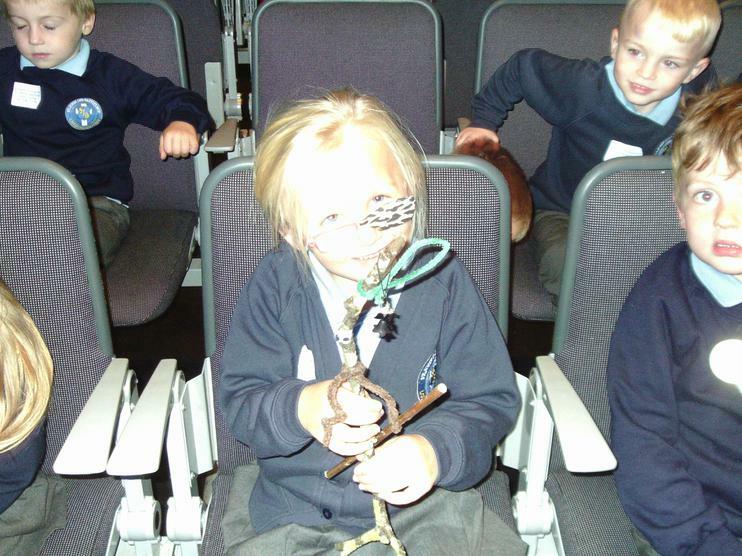 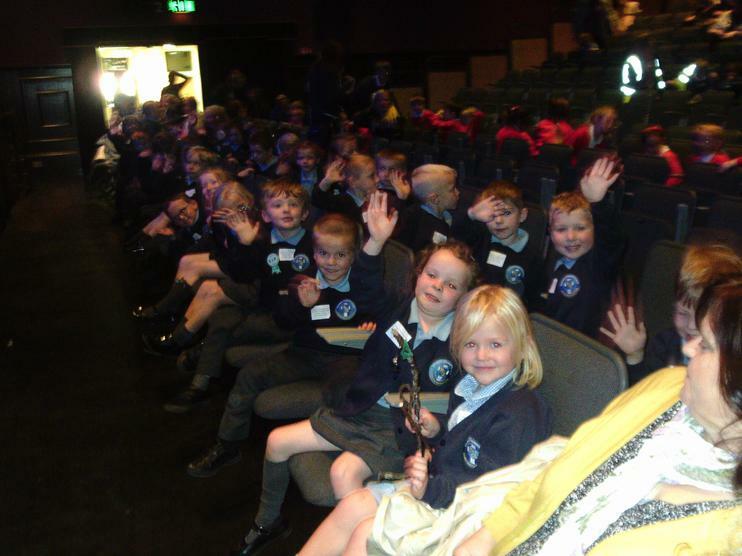 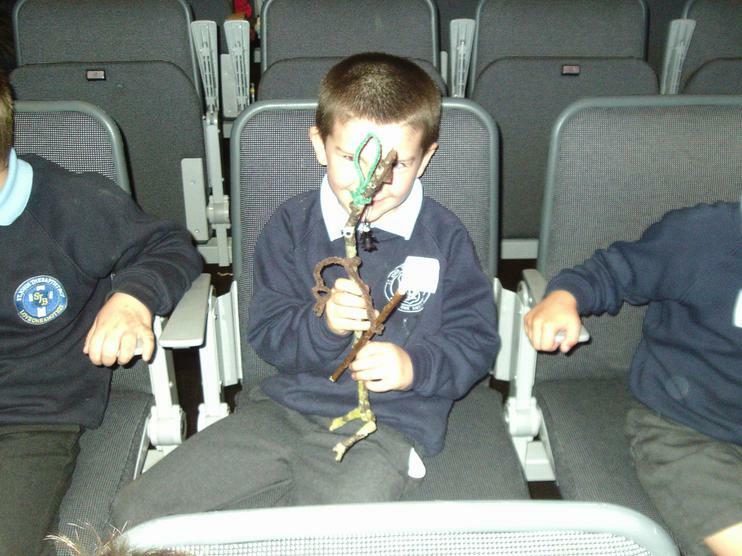 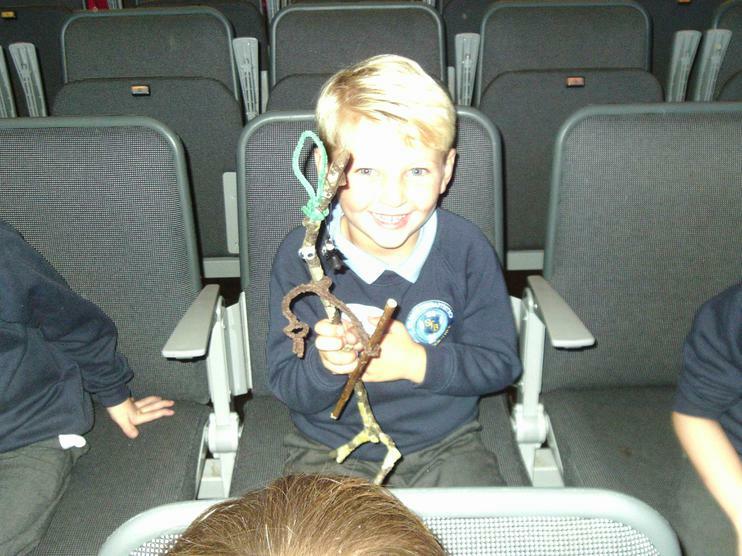 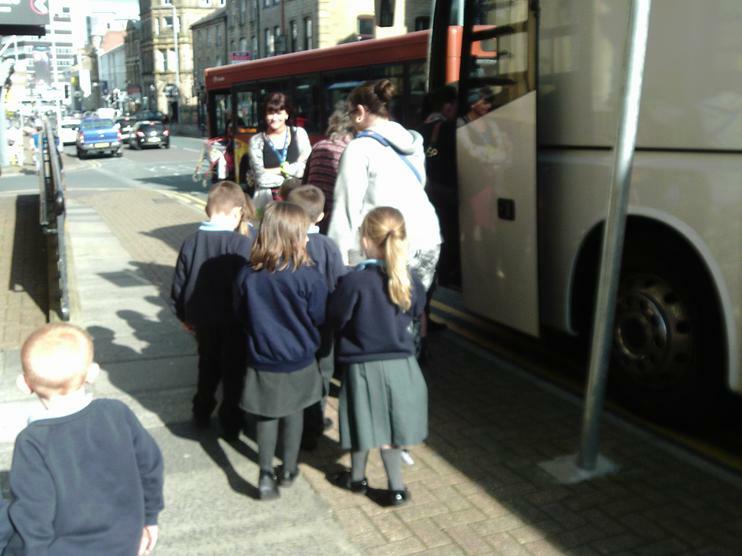 When we arrived in Burnley we saw lots of other children and schools there, even children from Padiham Green school. 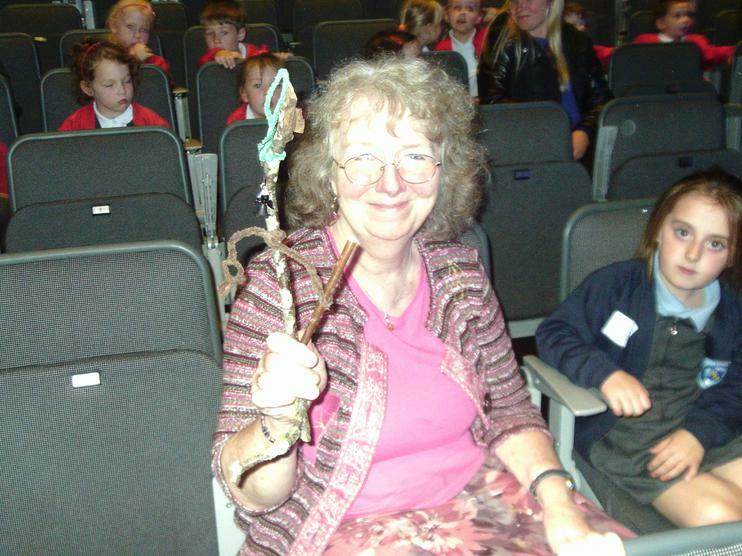 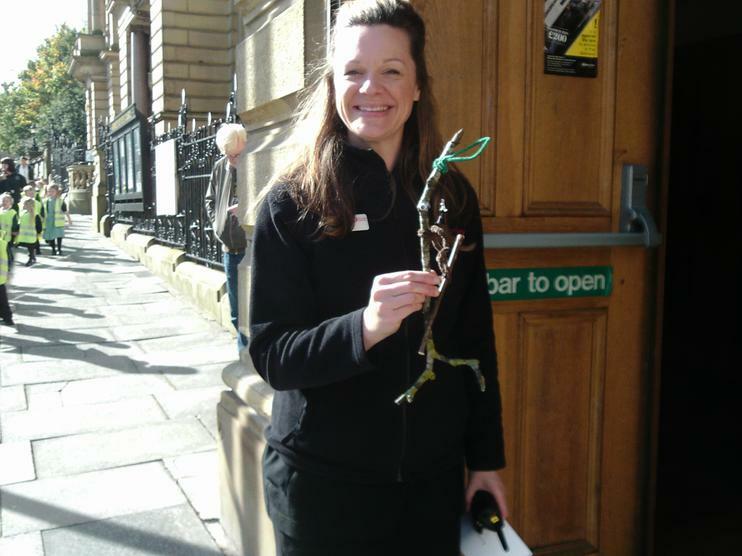 The Lady who welcomed us, loved Stickman and his Bat Angel and insisted on a photograph. 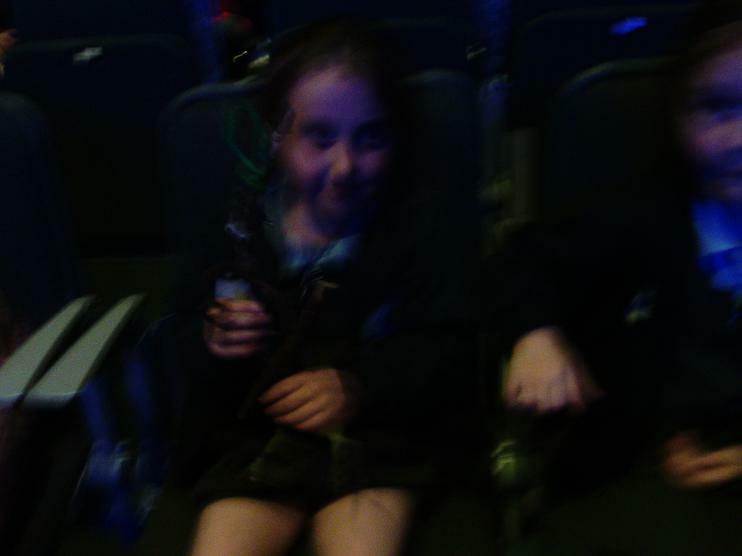 We were shown to our FRONT ROW SEATS by an Usherette and all sat down. 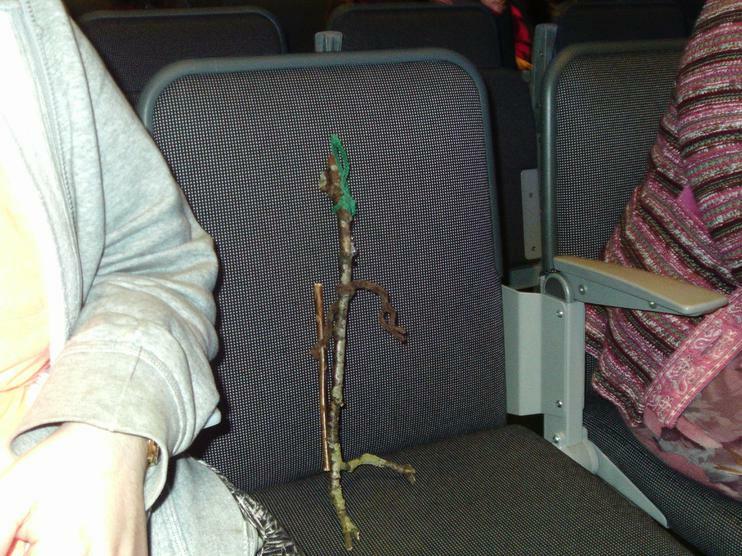 Stickman simply couldn't decide who he wanted to sit with and tried all of us before deciding to sit on a chair of his own. 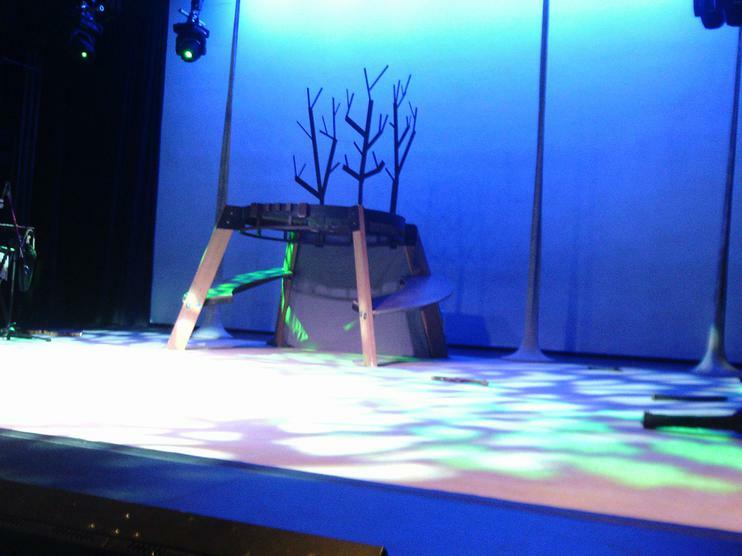 The show was simply amazing. 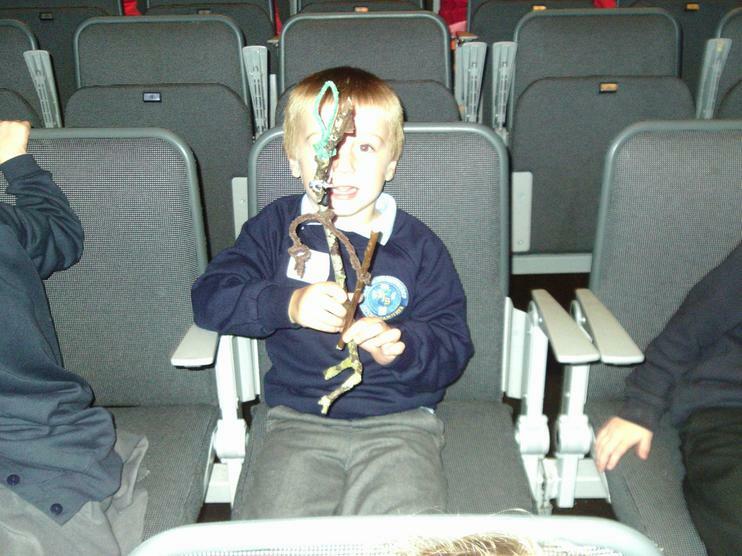 We couldn't believe how the three Actors made a river, the sea, snow and the Family Tree on the stage. 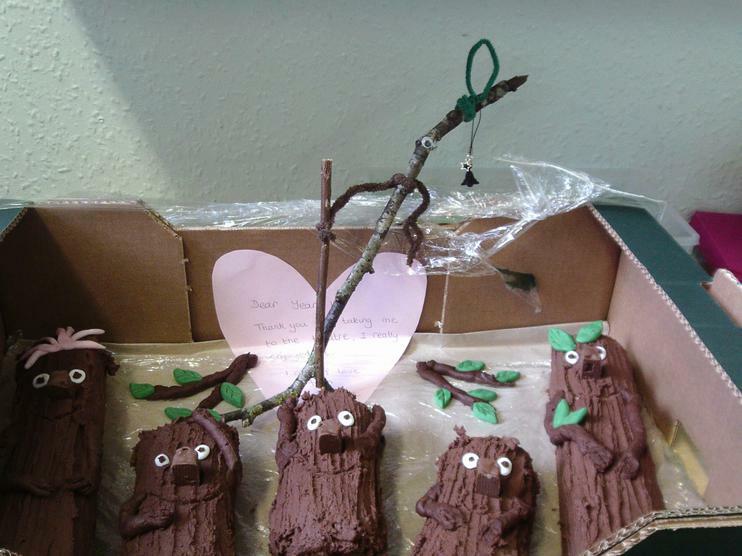 They were very clever. 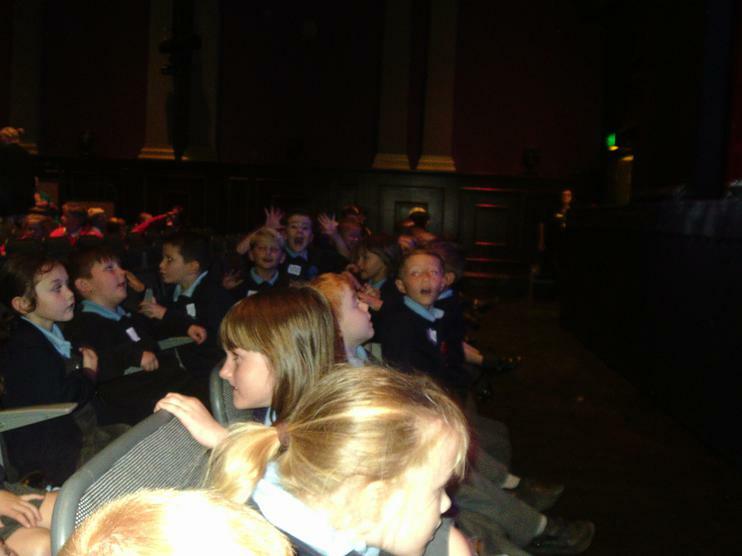 It was full of poetry, singing and humour from start to finish. 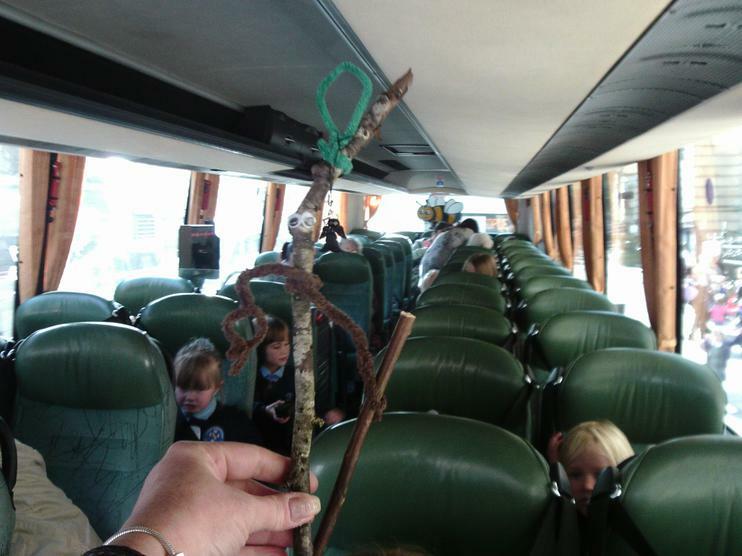 When we got back on to the Coach at the end we were all chattering the whole way back to school. 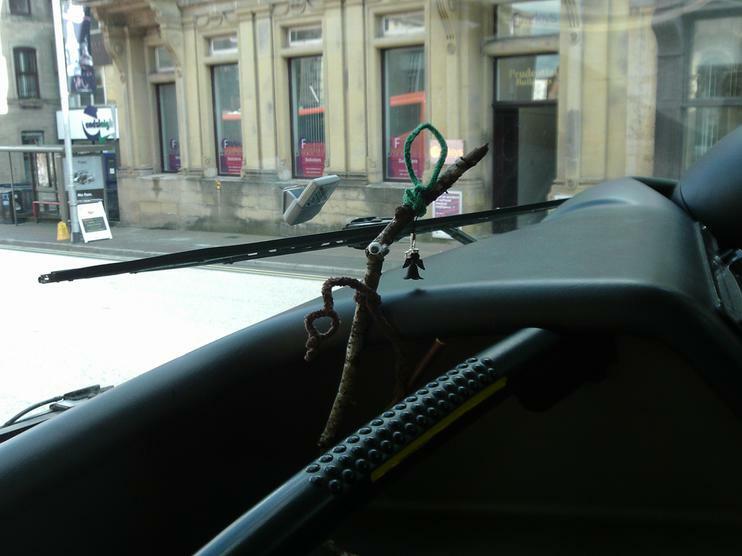 Stickman sat right up at the front for a good view and for a chat with the driver. 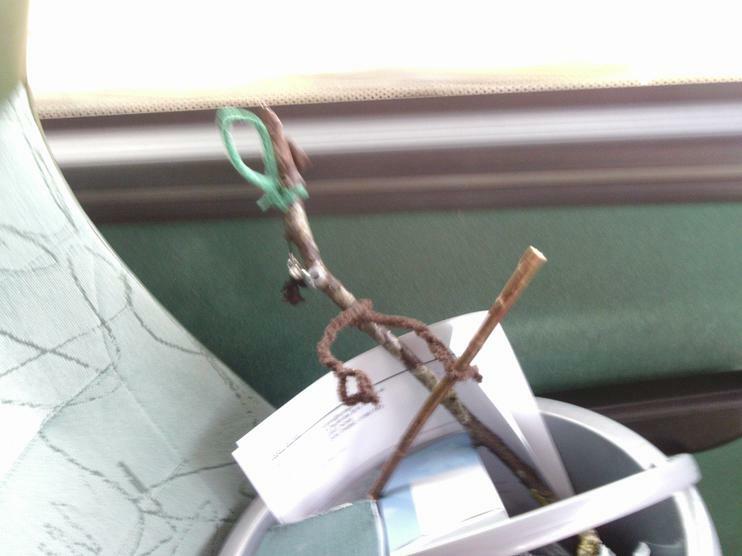 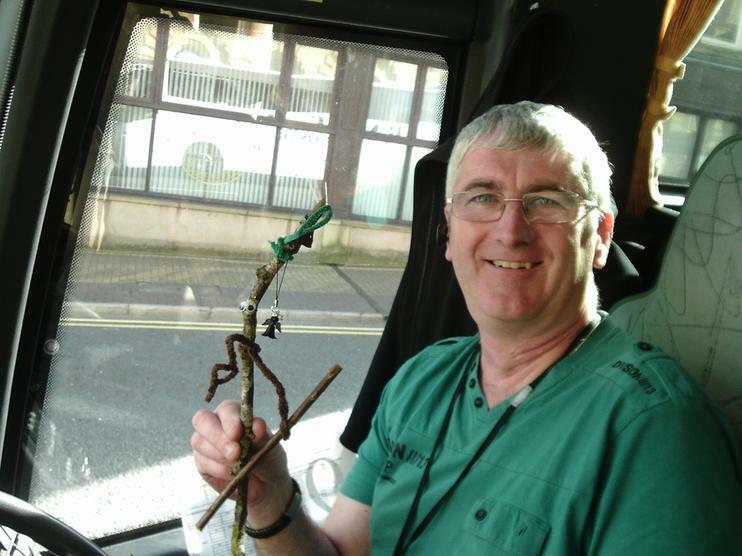 Our coach driver wanted a photograph with Stickman, he had never had a Star on his coach before. 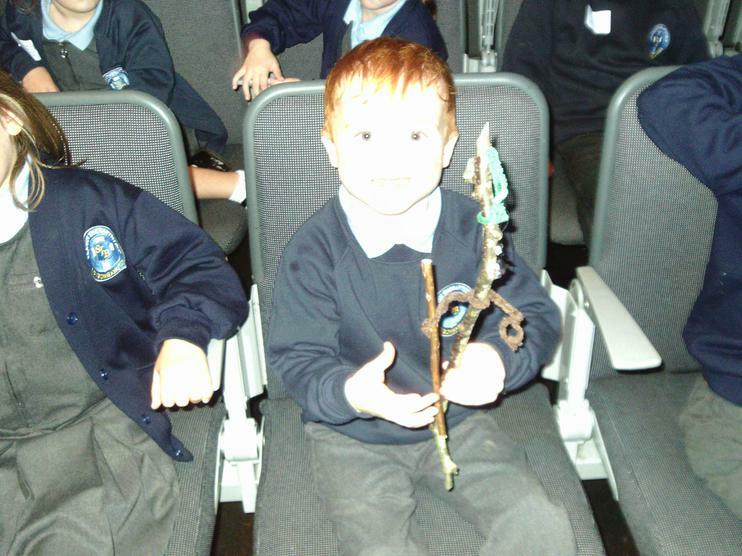 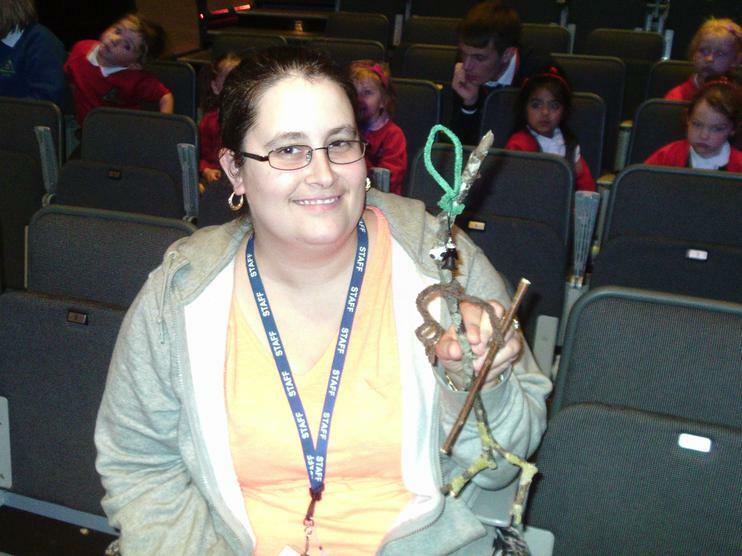 The whole afternoon was fabulous and the children were a credit to St John's school. 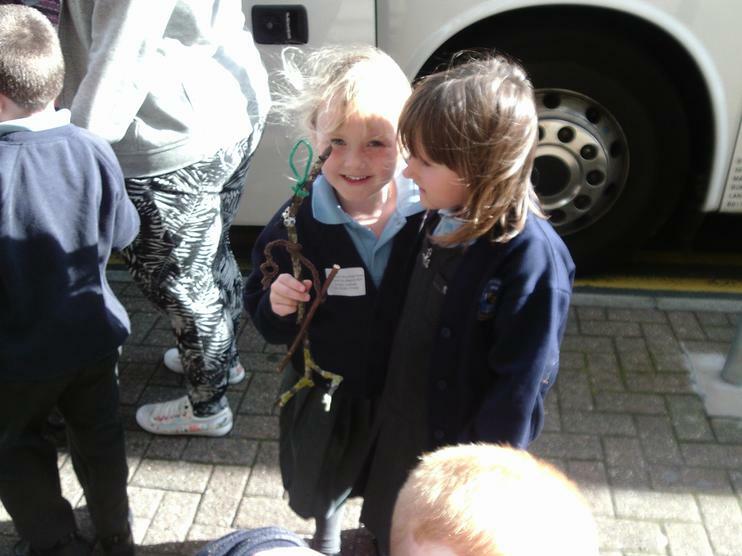 We all said a big 'Thank you' to our Grown up group leaders who came to help in their own time. 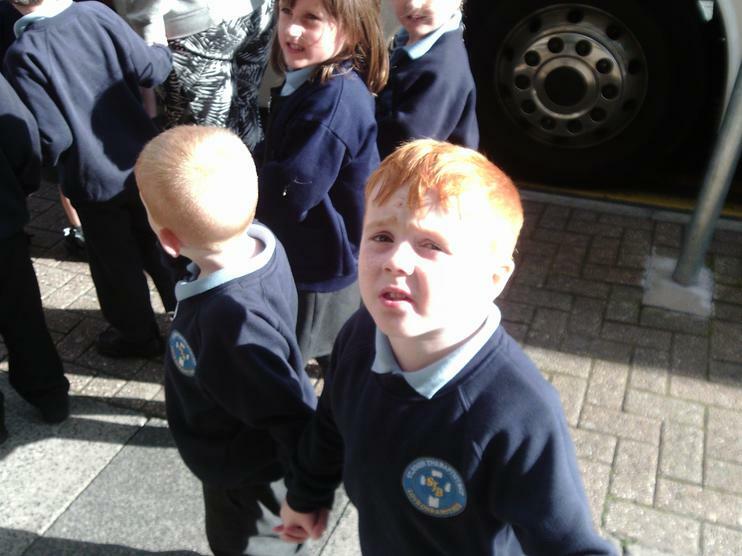 We then went out to share our afternoon with our Parents and Carers. 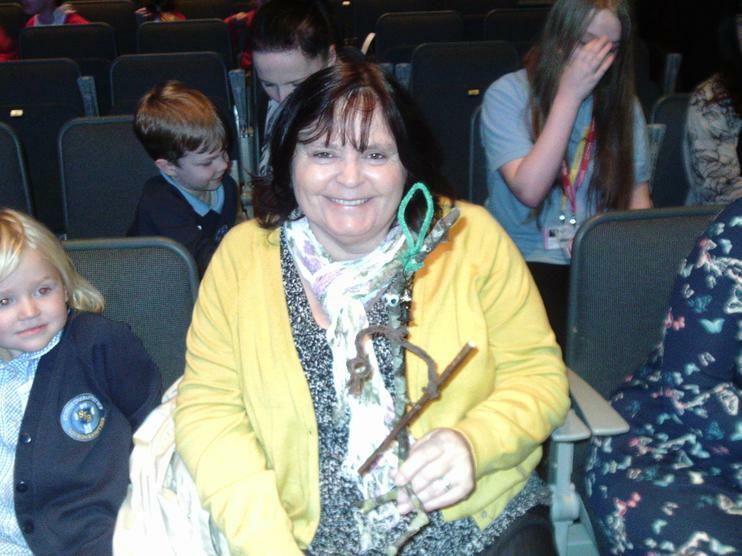 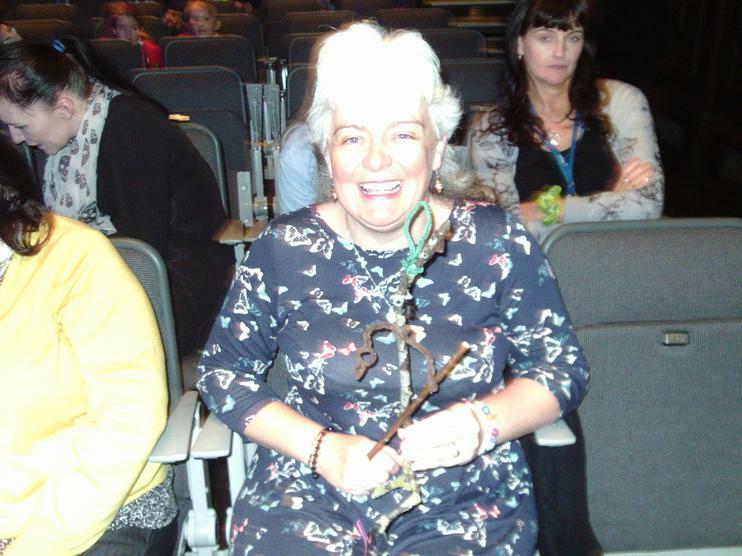 When we arrived in school on Wednesday morning, our lovely friend, Mrs Bracken gave us a wonderful surprise. 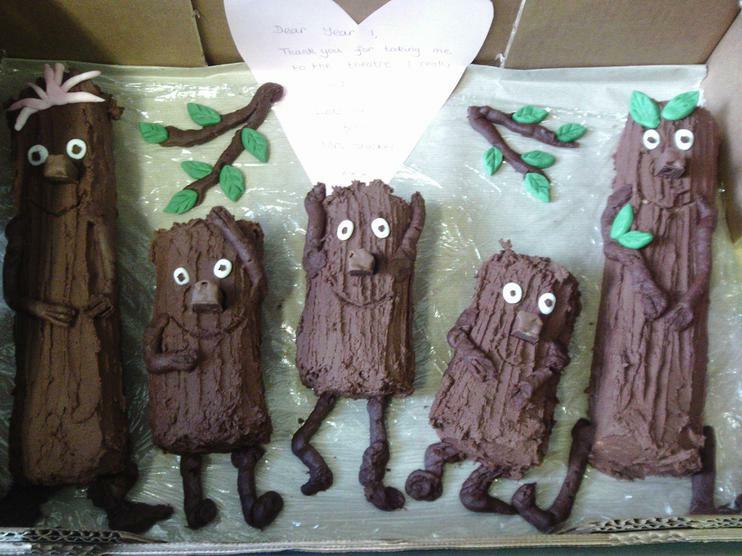 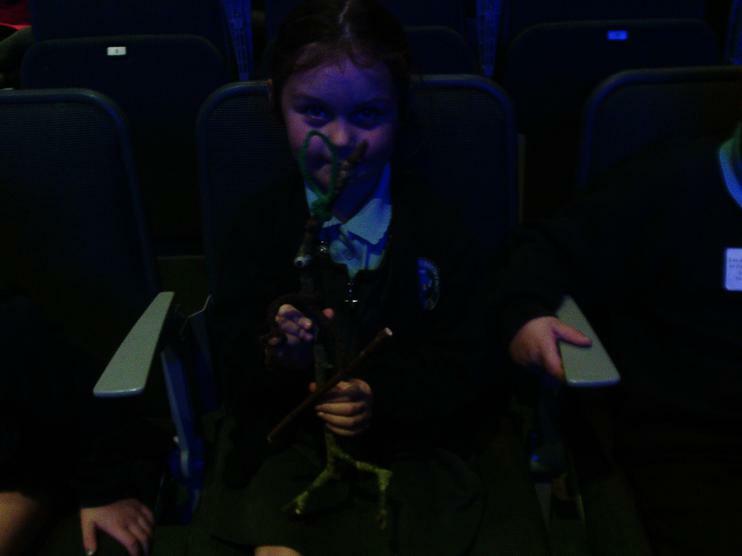 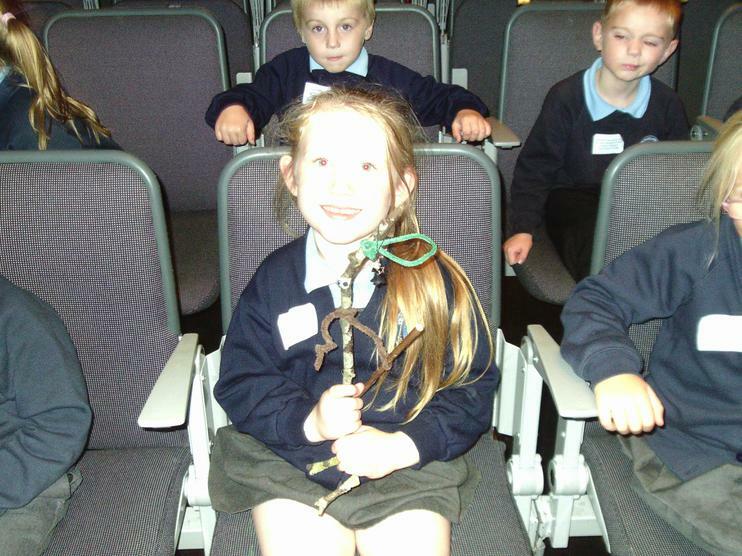 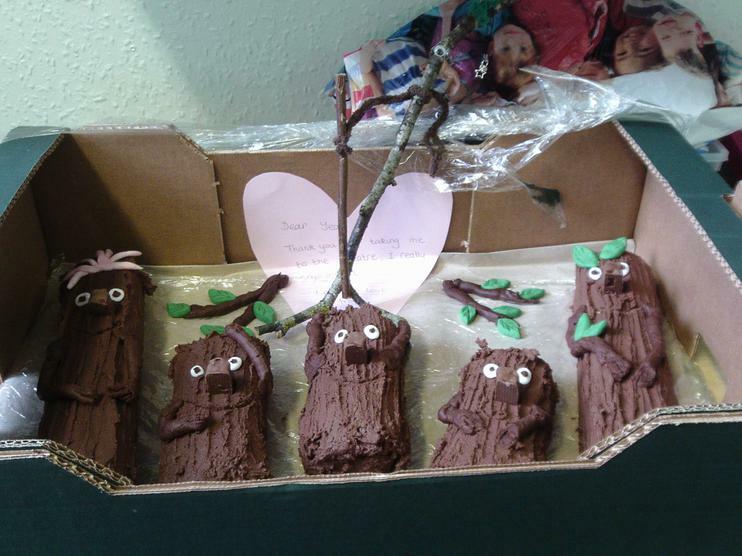 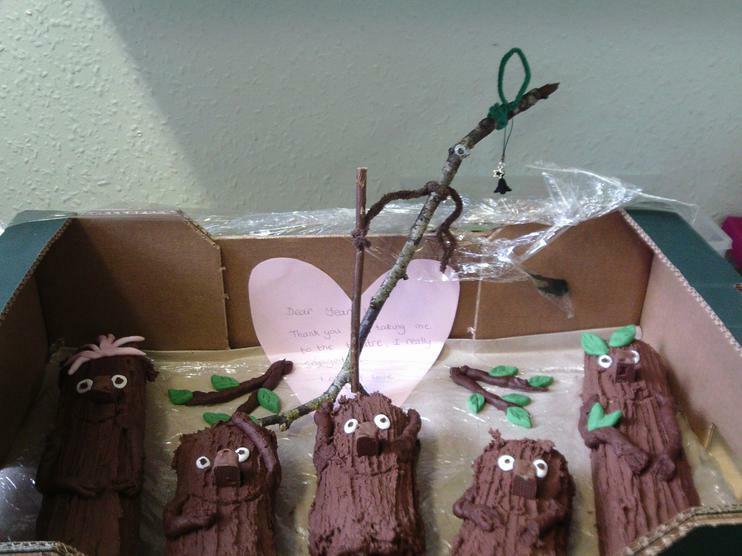 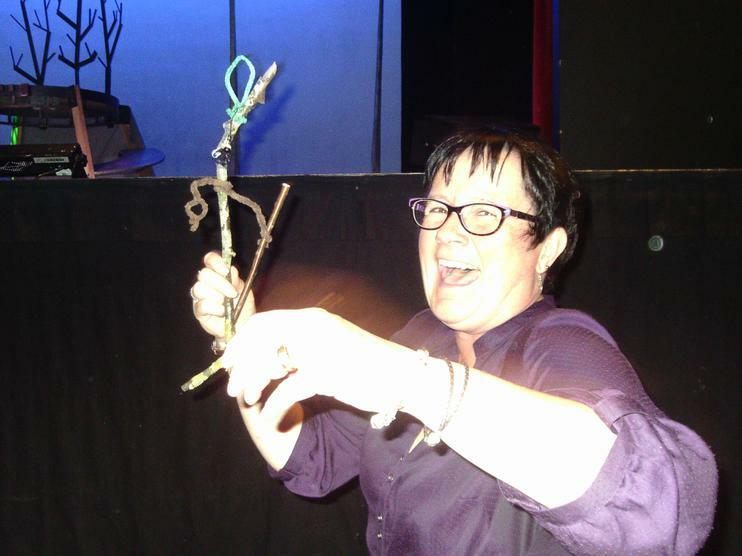 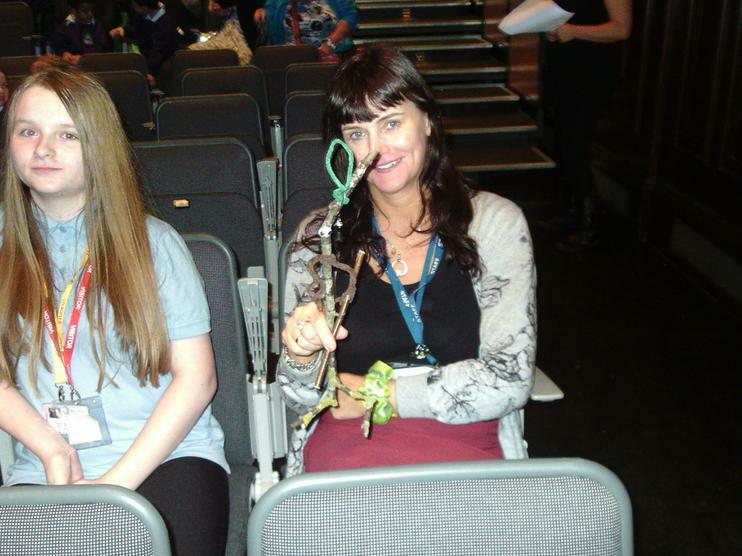 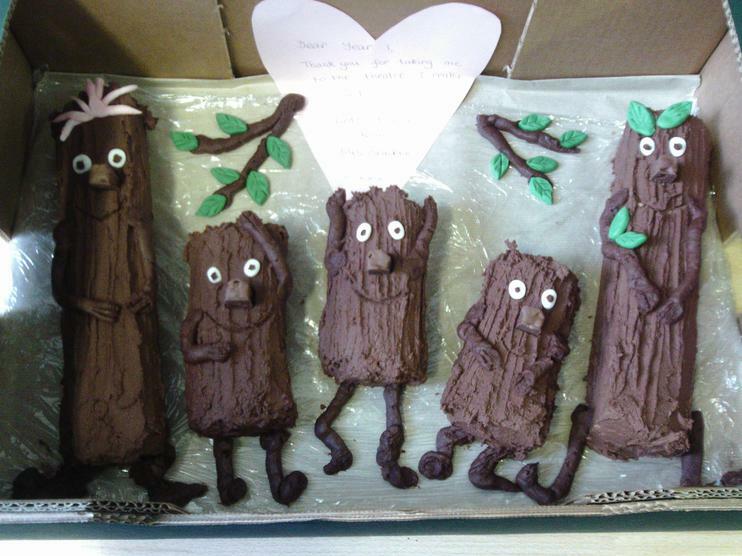 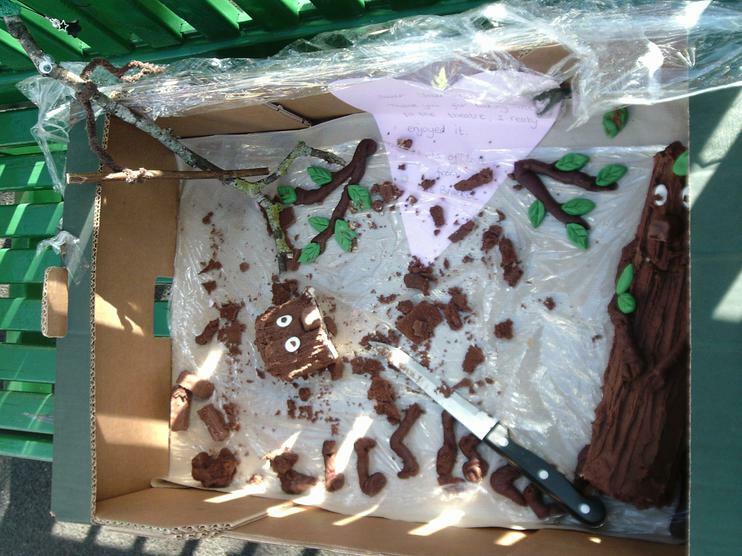 She had enjoyed Stickman so much that she decided to make a cake Stickman, his stick Lady Love and their stick Children Three for us all to enjoy! 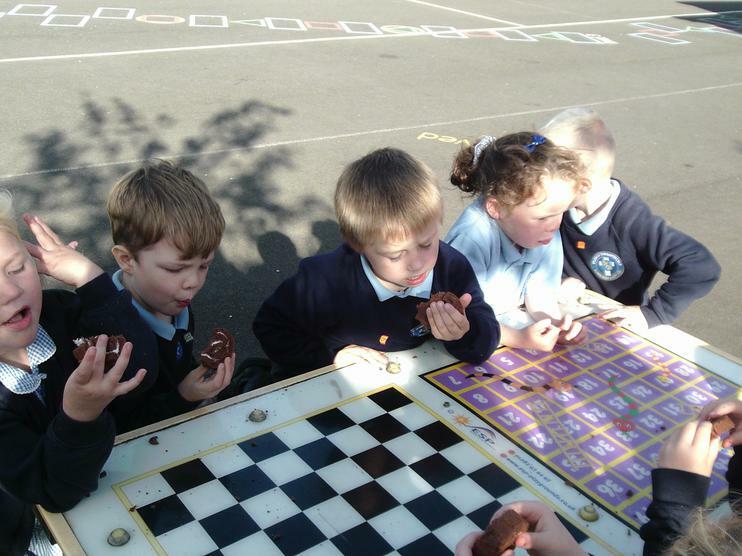 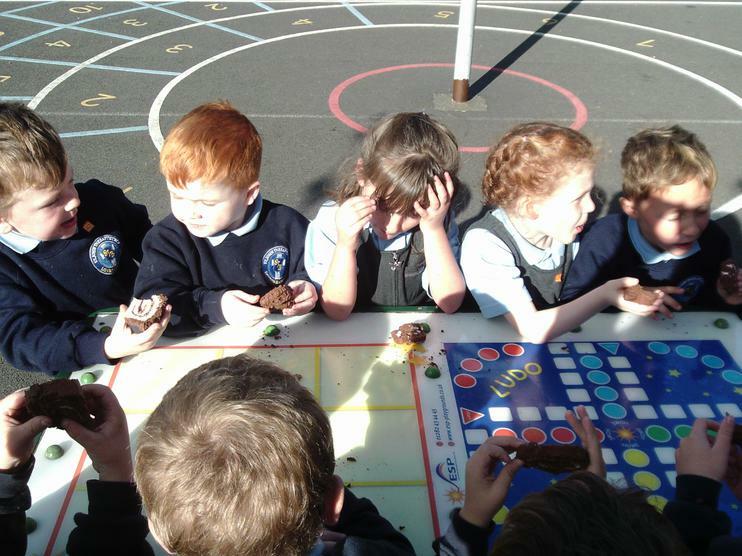 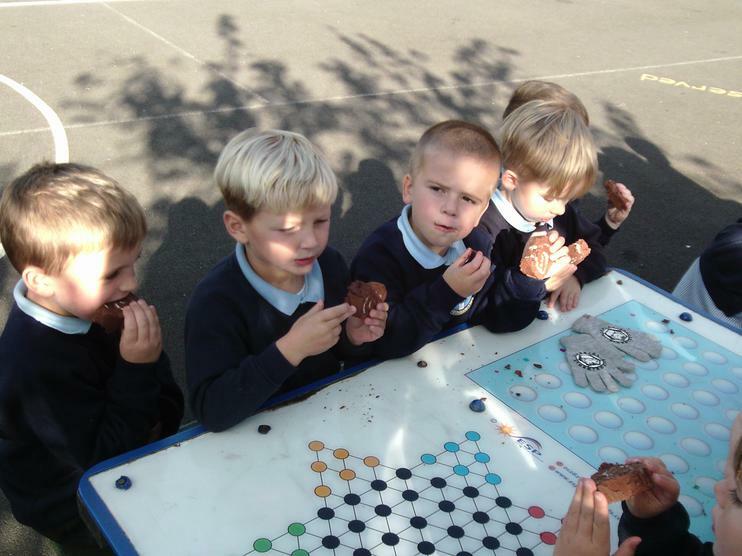 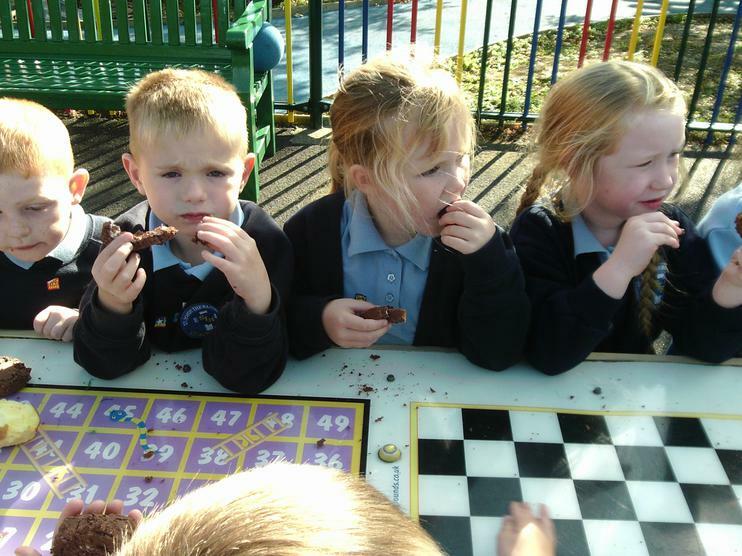 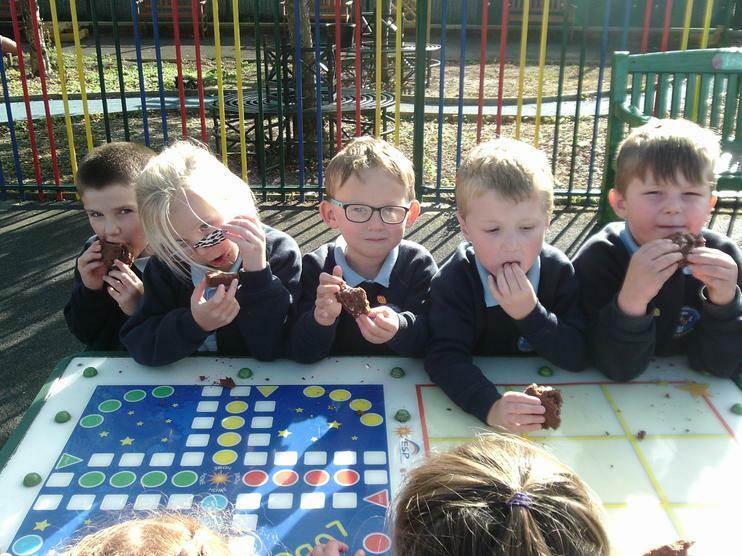 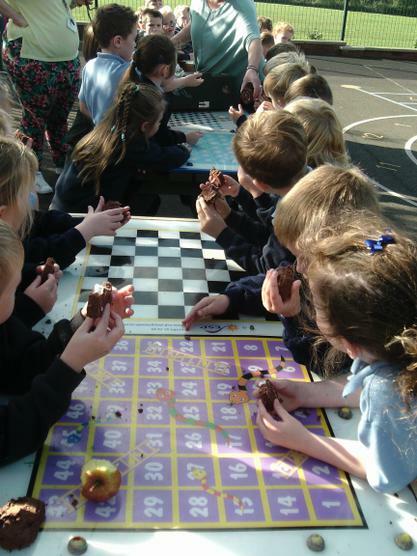 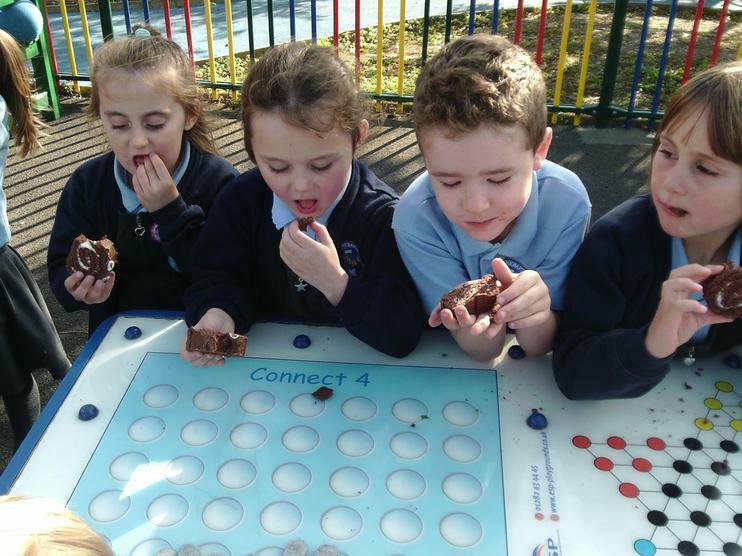 We waited until the afternoon and then sat outside in the Autumn sunshine to eat them, Thank you Mrs Bracken. 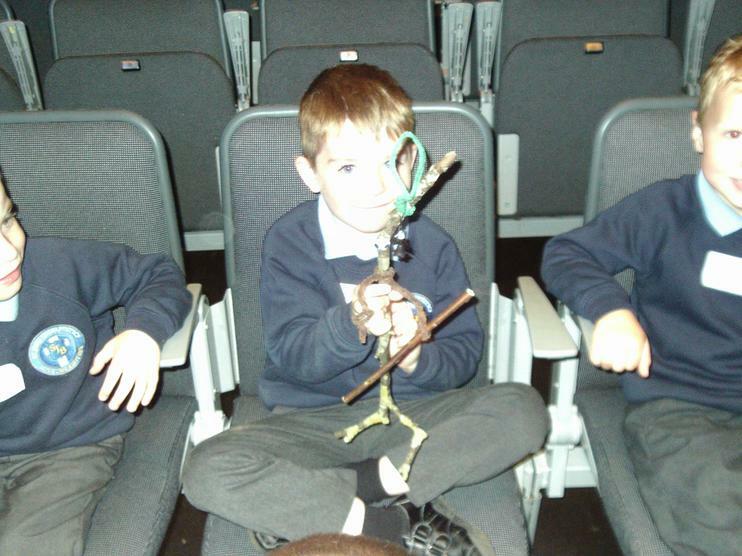 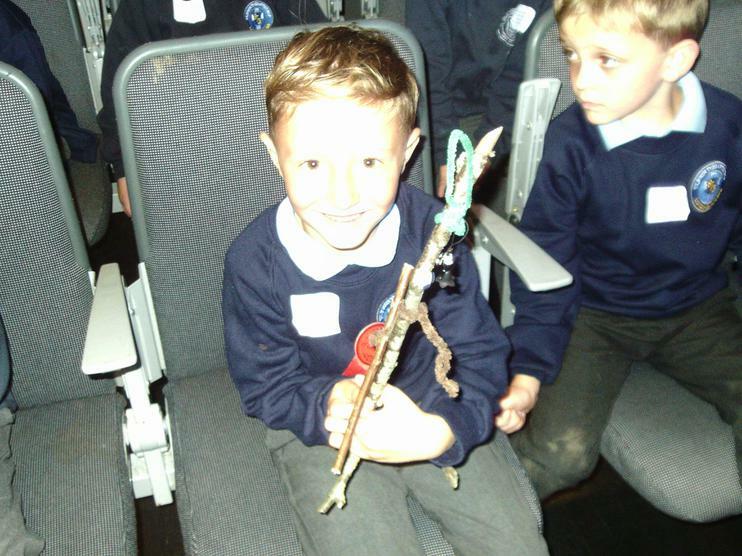 It was a lovely end to our Stickman trip.